We have been putting in a bit of effort designing a user interface on the app which simple to understand and intuitive but at the same time enables you to quickly navigate through the reams of information pilots need to have at their fingertips. To this end we have the following features to navigate through the ERSA and DAP procedures. 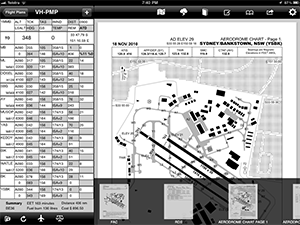 Tapping on a flight plan point brings up a detail view of the NOTAMS and weather for that location. For faster access (which for some aerodromes is a must) a single tap on the view displays thumbnails of all pages, which can be selected to take you quickly to that page. Pages can then be bookmarked to save for later referral.